All of the awesome stamps, Die-namics and supplies showed off over the past few days are NOW available for purchase in the MFT Boutique. It’s time to shop! Yay!! I colored all the funny characters with Copic markers and fussy cut them off, since I wanted them to pop out the photo booth strip windows. Next, I added a splash of color on a card base, stamping some ink splotches using the Distress Patterns stamp set. I die-cut a photo strip out of Primitive White card stock and added the funny animals inside the windows. I also placed a strip of vellum behind the strip to soften the background a bit next to the windows. Finally, I die-cut the sentiment out of a scrap of Summer Splash card stock using one of the captions from the #Captions Die-namics. 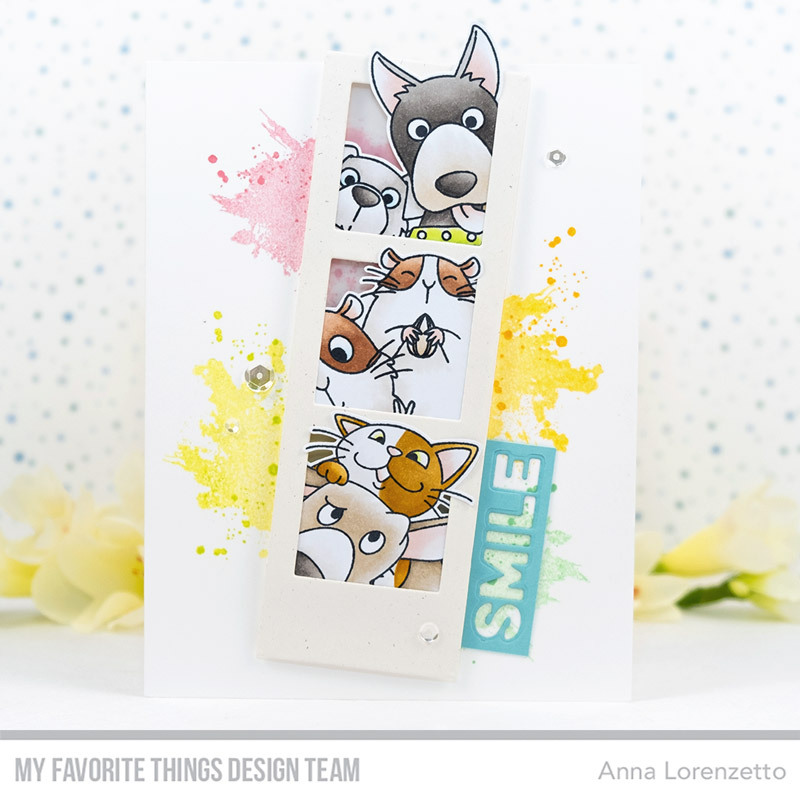 Be sure to visit the MFT Blog to see all the amazing projects made by the DT and friends using the new release products! Absolutely adorable; this just made me smile! Love the background!! This snapshot set is just the cutest!! Love so much the beautiful design and colouring!!! This is soooo adorable!!! I love how they are popping out of the frames; so fun!! Those silly little faces crack me up. So cute! This is a really fun, cute card. Love the way the animals jump from behind the photo strips. How fun! 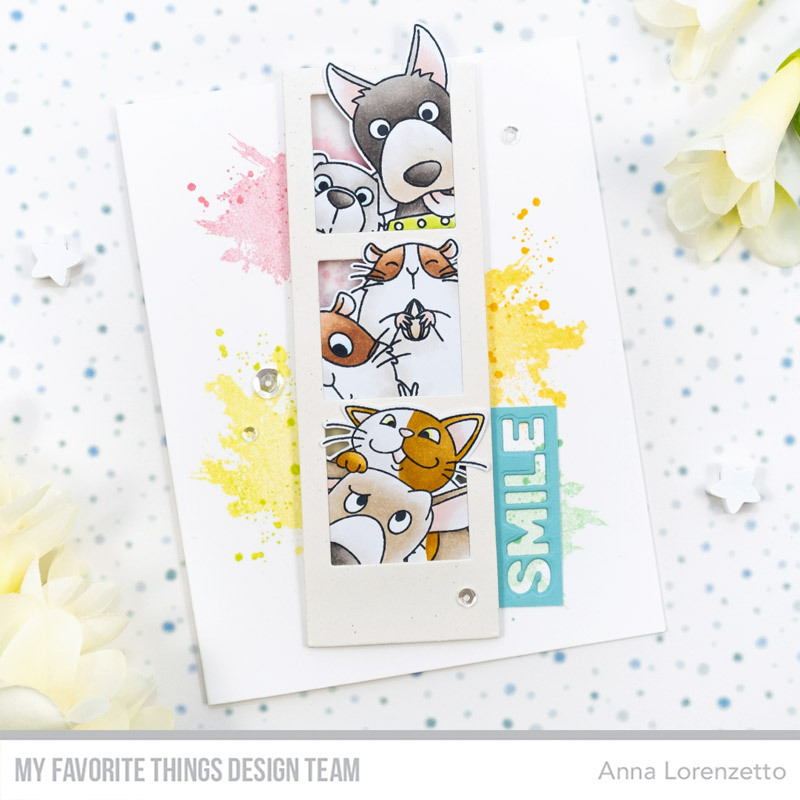 That photo strip die is wonderful, so many possibilities – love what you did with it! Very cute card. I really like the background! What a fun card! I love the background. Awesome coloring and I love the SPLATTER! This stamp set is awesome! I like how you have the animals popping out of the photo booth frame. How fun with this photo strip of all these cute critters. Love this great card and all those cute characters! love the Picture perfect set! the cute animals are simply adorable! love the background you created too! thanks for the inspiration Anna! Such a cute card! Love how you made the characters pop out of the Photo Booth Strip and how you used the negative space for your sentiment! Great ideas! Thank you for the inspiration! Love that photo strip and those sweet animals!! Very cute. I like how to cut the animals out and made them look like that were popping out of the frames. Love the selfie critters! Darling card! This card screams FUN! Thanks for sharing! Great card. It makes me smile. Adorable and fun! Love the cute critters crowding in to be in the windows and your splatter background is fabulous with this! Such an amazing project! You rock this release! aww this is so fun – love the splatts you created!! Fabulous card! I love the splatters in the background! Love the selfie line in this release. Your card is adorable and a great way to showcase this new release. Oh my gosh! I LOVE the way the animals are popping out of the frame! Very clever. Absolutely love your card! I love how your images burst from the photo booth die. So adorable and wonderfully funny card – so playful!